Hannover v Leipzig was the debut of new Hannover 96 head coach Thomas Doll. But fans of die Roten hoping for a new coach effect were disappointed as Leipzig led by young American Tyler Adams walked away with an easy victory. It only took Leipzig one minute to produce their first chance. A freekick by Marcel Halstenberg produced a fine save by goalkeeper Michael Esser. Whenever Leipzig started to pick up the pace during the opening stage of the match, Hannover were in trouble. Leipzig had further chances. In the 10′ minute Marcel Sabitzer’s close-range shot was denied by Esser. Then in the 20′ minute, Matheus Cunha’s header after a corner hit the crossbar. Somehow, however, Hannover managed to hold on and kept Leipzig off the scoreboard. But while Hannover did well to keep Leipzig off the scoreboard, they also struggled going forward. Whenever they did win the ball, Hannover were untidy in their buildup making it easy for Leipzig in defence. Just before halftime, Leipzig were given the golden opportunity to open the scoring. Kevin Akpoguma brought down Matheus Cunha at the edge of the box, Halstenberg stepped up to give Leipzig the lead. Even with Leipzig up the score did not reflect the actual game at halftime at all. Leipzig were dominant in midfield where young American Tyler Adams was running the show, but at the same time Leipzig lacked an outlet with Timo Werner out with the flu. After halftime, another American entered the fray with Hannover bringing on Bobby Wood for Florent Muslija. Meanwhile, goalkeeper Yvon Mvogo had to replace Peter Gulacsi in Leipzig’s goal. The two substitutions were the most eventful occurrence in the first 15 minutes of the second half. Leipzig were quite happy to control the game and their lead. Hannover, after all, continued to struggle whenever winning the ball. Instead, Leipzig added a second goal after a corner kick in the 64′ minute. Hannover’s defence, lacking any sort of organisation, failed to pick up a ball across the goalmouth. Willi Orban, left unmarked, picked up the ball and headed it across the goal line to make it 2-0. In the 66′ minute, Yussuf Poulsen almost added a third from another corner with Esser stopping the ball on the line following a backheel flip by the Leipzig striker. Expectations were now that the floodgates would open for Leipzig. But die roten Bullen lacked the consequence in their attacking game. Instead, Orban added another one after a corner kick in the 85′ minute. Given to much room, the captain hammered home a corner by Emil Forsberg to make it 3-0. Set pieces have been one of Leipzig’s biggest problems over the last two seasons. Hence, it is a reflection on Hannover’s defence that tonight all three of Leipzig’s goals came from set pieces. 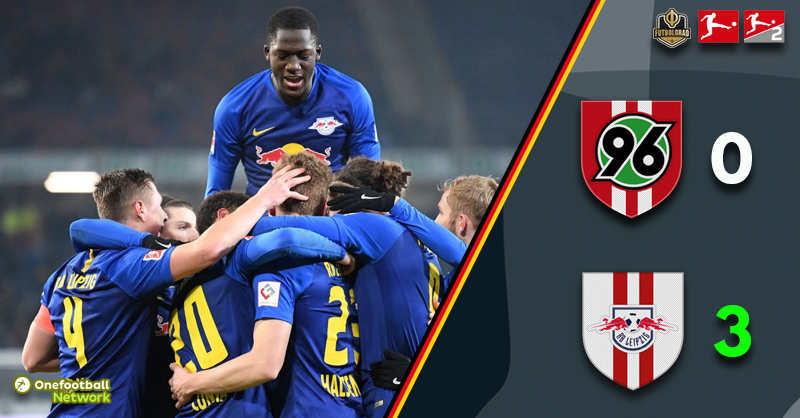 Overall, it was a deserved victory for Leipzig, who were able to put the pressure up on third place Gladbach, who will face Schalke in the Topspiel on Saturday night. “Yeah another good game for us today,” Tyler Adams said after the match. The 19-year-old holding midfielder has made the transition from Major League Soccer to the Bundesliga look easy. “It is the guys around me, the coaching staff has pulled me aside watching video to help me figure out the style of play coming from New York and playing a similar system in MLS has definitely helped me,” Adams said after the game. The midfielder completed 83.1% of his passes, played one key pass and won two of his three key passes. Furthermore, with him patrolling in midfield Hannover never had a chance to break forward as he not only broke down the opponent’s attacks but also instigated quick counter-attacks on several occasions in what was a perfect display overall. Set-pieces have been a big talking point in Leipzig over the last couple of years. Already under former head coach Ralf Hasenhüttl Leipzig struggled both with defending and scoring from set-pieces. Tonight, however, set pieces were the key for Leipzig as they struggled to break down Hannover from open play. For the first time since April 2014 (Bayer Leverkusen, four) a Bundesliga team records three goals by defenders in a single league game. 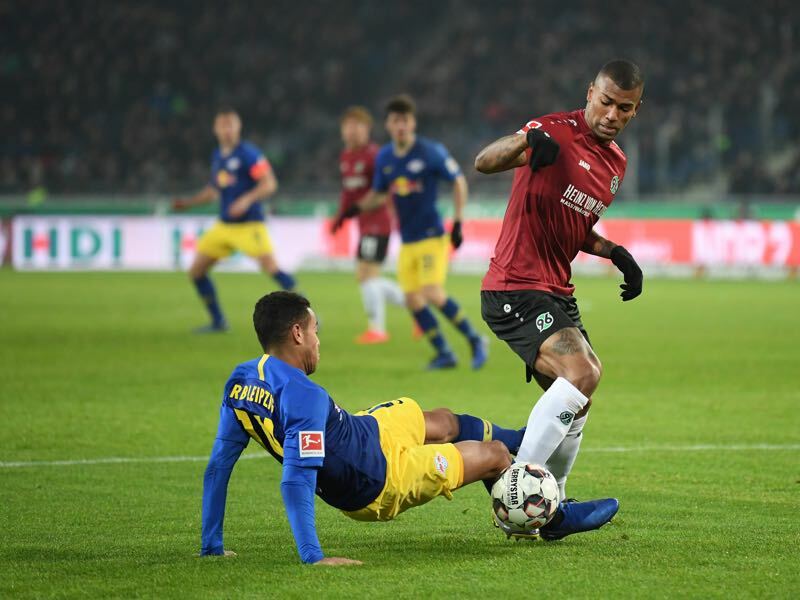 Hannover lose their fifth home game in a row without finding the back of the net – this happened only twice in Bundesliga history (Cottbus 2002/03 and Hannover 2015/16). For the first time in his Bundesliga career, Marcel Halstenberg had a hand in two goals in one match (one goal, one assist).